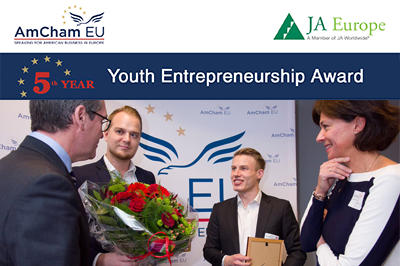 Five nominees would be selected by a jury from JA Europe and AmCham EU and the winner invited to the AmCham EU Gala Dinner on June 8th 2017 with EU policy stakeholders as well as AmCham members as guests. The winning start-up would be awarded a cash prize of 10,000€ and access to European CEO's mentors selected from across the membership of AmCham EU. In order to make the most of the moment, these young people will be given the opportunity to tell the audience about their business and future plans. Finals will be organized by JA Europe in Brussels in the morning of June 8th. All finalists will meet with the AmCham jury and will present their presentations (up to 3 min) and answer questions from jury (5 min). The jury will evaluate all presentations and the teams will be announced about the results at the AmCham EU Annual Gala dinner that evening, to which all finalists are invited to attend.